Recently the Unapologetic Knitter, Meghan Schmaltz wrote a helpful article on storing and organizing your yarn stash. It was filled with tips to organize and tame your stash so that you can easily find the yarn you want to use for your next knitting project. Here it is: How Do I Store my Yarn Stash. Now that you have tips and tricks to get your stash under control, how do you organize your knitting projects? Do you have them in plastic bags all over the house? Shoved together in one big bag so that you don’t know what’s going on with any particular project? Today let’s talk about how to keep your projects organized and some ideas for organizing projects based on size or where you knit. Here are some things to think about for organizing your projects. Let’s begin by thinking about where and what you knit so you can find the best yarn bag, tote, or caddy to suit your needs. Do you like knitting on the go? Do you knit while commuting to work? Do you like couch knitting at home? Do you take knitting when you travel? Do you like walking and knitting? Do you knit small portable projects? Do you prefer larger projects and don’t mind taking them wherever you go? Do you like multi color knitting projects? Do you like to have more than one project with you? Now we’ll take a look at the various knitting totes and bags available to fit your needs. There are knitting bag organizers that work with every knitting style you have. I personally own a wide variety of yarn bags so that I can grab just the right one to fit the project (or projects!) I’m currently working on. I decided to do a bit of research and found a bunch of handy knitting bags, totes, and caddies for you to checkout. #1. Luxja Yarn Storage Bag comes in an adorable sheep pattern. This canvas bag has a large central pocket with 4 grommets allowing you to thread yarn through; great for color work and Fair Isle knitting projects. An outer zip pocket fits notions and small knitting needles or crochet hooks. Includes a handle. Small projects and knitting on the go. #2. Sleepyville Cute Cat Yarn Tote Bag is an adorable canvas tote for the cat loving knitter! It has an 11” leather shoulder strap and zip pocket on the exterior. The interior is fabric lined with two pouch pockets. You’ll get lots of compliments on this bag. #3. Little Grey Rabbit Large Yarn Caddy is a cotton canvas bag that’s machine washable. Holds up to 40 pounds, the sturdy construction keeps it standing straight. Size pockets on the outside allow you to organize lots of notions, needles, scissors, and crochet hooks. Comes with easy to attach velcro dividers to make two or three large compartments. Has soft sturdy handles to make the bag easy to move or take with you to knitting club. #4. Everything Mary Knitting Tote Bag provides a pretty way to keep your yarn and projects organized for knitting anywhere and everywhere! The large tote has a floral patterned exterior, fully lined interior, and comfortable shoulder straps. This brand has been featured on Oprah’s Favorite Things because they create thoughtfully designed storage solutions. This knitting tote is no exception. It has 12 storage organizers for yarn, notions, needles, and patterns. #5. ArtBin Needle Arts Yarn Storage and Folding Caddy can store one or several projects. It’s made of an easy care nylon canvas mounted on a folding metal base. The caddy itself holds enough yarn to knit an afghan or sweater and has two detachable pouches. One is a needle roll for knitting needles or crochet hooks. The other is a zippered pouch with three pockets great to organized notions, circular needle cables, and more. Ideal for placing next to a favorite knitting spot such as chair, bedside, or couch. #6. BeCraftee Knitting and Crochet Tote is loaded with yarn storage and lots of pockets. Made for knitting on the go, this tote has an easy carry handle as well as a detachable adjustable shoulder strap and zip-top closure. Perfect for larger project, this yarn bag holds up to 10 skeins of yarn. Made of linen canvas and cotton lined, this tote has double stitch construction to keep in standing up straight. Four holes at the top allow for multi projects or multi color work to keep yarn tangle and pet free. With all these features, it’s no surprise this is an Amazon Top Selling product. Available in Blue or Red. This small project bag is made from a sturdy cotton canvas with a drawstring closure and wrist strap. Inside, you’ll find several pockets as well as 3 o-rings to feed yarn for tangle free knitting. #8. Retro Style Knitting Case is a fun and sturdy bag for knitters who want a stagecoach vintage-look bag. It has hard sides, a handle and detachable shoulder straps perfect for holding your travel knitting projects. Red leatherette exterior and lined in a pretty black and white polka-dot fabric, this bag also has several see-through interior zip pockets for notions and needles. #9. Teamoy Walking and Knitting Tote Bag. If you love to knit while walking, this bag is for you! It’s designed to sit comfortably on your forearm keeping your hands free for knitting. This fully lined lightweight canvas bag has 4 interior pockets and an outside zip pocket. There are also 4 grommets at the top to feed yarn while keeping it clean and tangle free. #10. Stitch Happy Knitting Bag is made for knitting on the go! Use to for yarn, projects, notions, and even a few personal items. With a 4-way interior divider, you can hold up to nine skeins of yarn or several projects. There are slits at the top to feed the yarn so it stays pet-hair and tangle free. The bag has 7 pockets plus an accompanying case for small notions and accessories. It also has a halo-zipper to keep yarn from getting snagged in the zipper! 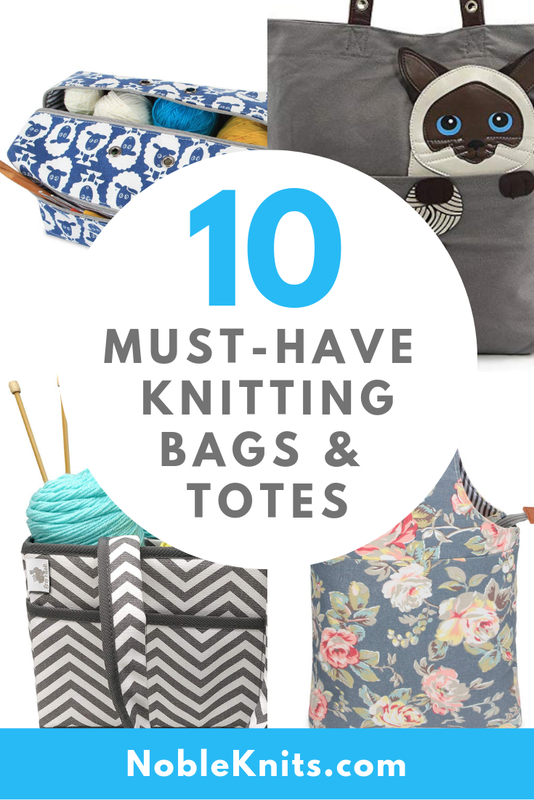 Do you have a favorite knitting bag? Do you like small or large knitting totes? How do you store your projects? I’d love to hear; let me know in the comments below.